A tour around France’s vineyards is the perfect holiday for wine aficionados, offering an irresistible combination of beautiful countryside, great food, and of course, top quality wines. If you’re looking for a holiday with a difference this year, why not head to the vineyards of France? One of the most famous wine-producing countries in the world, France offers plenty of diverse regions to explore, and its combination of great wines, good food and rich history attracts millions of visitors to its vineyards each year. When it comes to choosing a French vineyard to visit, you really are spoilt for choice. We’ve rounded up some of the best wine regions the country has to offer. Stretching almost 300km, Burgundy is one of the most famous and highly regarded wine-producing regions in the country. And the unique character of the area’s ‘climats‘, and its wine making techniques, has led to it being added to the UNESCO World Heritage list. Although the region does produce some high quality whites, it is best known for its fantastic red wines which can keep for up to 30 years. Like Burgundy, the Bordeaux region of Aquitaine is also one of the most famous wine regions in the country. In terms of scenery, the area is rather plain, but what it lacks in natural beauty it more than makes up for with the quality of its wines, which have been produced in this region for around 2,000 years. Its reputation has been built on the back of the superb red wines that are produced here, particularly the top quality, full-bodied clarets. Provence in the south of France is perhaps the most scenic of the country’s wine regions, with its lavender fields, golden sunflowers and views of the Mediterranean to the south. And its warm climate and even warmer welcome make it a firm favourite with visitors. The region does produce both red and white wines (the most famous of which is Bandol, which has been around since the middle ages) but it is best known for its rosé varieties, such as Côtes de Provence and Côteaux d’Aix. 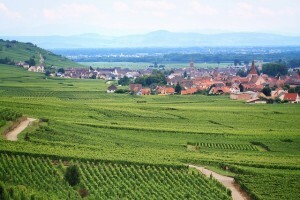 If you’re looking for something a little different, consider checking out the Alsace vineyards. The area’s proximity to the German border means that the wine, like the region, owes a lot to Germanic tradition and culture – dry or fruity white wines such as Riesling, Sylvaners and Gewurtzraminers are the order of the day here. The area has a rich and fascinating history, and the wine route is dotted with quaint and picturesque villages. No list of French vineyards is complete without a mention of the Champagne region. Famous for its eponymous sparkling wine, the Champagne region is the most northern of France’s wine-producing regions and is located primarily around the towns of Reims and Epernay. The historic city of Reims with its 13th Century gothic cathedral is great for sightseeing, but for the best cellar visits and champagne tastings, you should head to the smaller town of Epernay, which is home to some of the best known champagne producers, such as Perrier-Jouët and Moët & Chandon. For quality wines without the steep prices, head to some of south-west France’s lesser-known vineyards, such as Cahors, Bergerac, Marcillac or Vin de Pays du Lot. Less famous than their big name counterparts, these regions nevertheless produce quality wines ranging from dark, rich reds, through to sweet aperitifs. With its variety and quality of wine, picturesque landscapes and rich history, it’s easy to see why thousands of visitors head to France’s ‘wine-country’ each year. It also has the advantage of being within a hop skip and a jump of the UK, meaning that heading off on a wine-tasting mini break is easy to do – all you need is your passport, European travel insurance and plenty of luggage space for all the wines you’ll want to bring back! *Sponsored promotion. Images via Pixabay. France Travel, France vineyards, Wine Travel. Bookmark. I love that you added that you can hit up Reims cathedral, as seeing it after a bit of wine tasting can only make the afternoon light more magical! Great list of vineyards around France! Would love to do a wine tour next time we are in France! Awesome list of French vineyards. Great post. I so wanted to do Bordeaux and the South of France for this but could not. Thanks for the quick trip. I am definitely a wine lover. Great list. I really want to go to Provence, especially for those lavender fields. I am not a wine person, but I love vineyards. And well, these are all globally acknowledged ones. Loved reading about them.